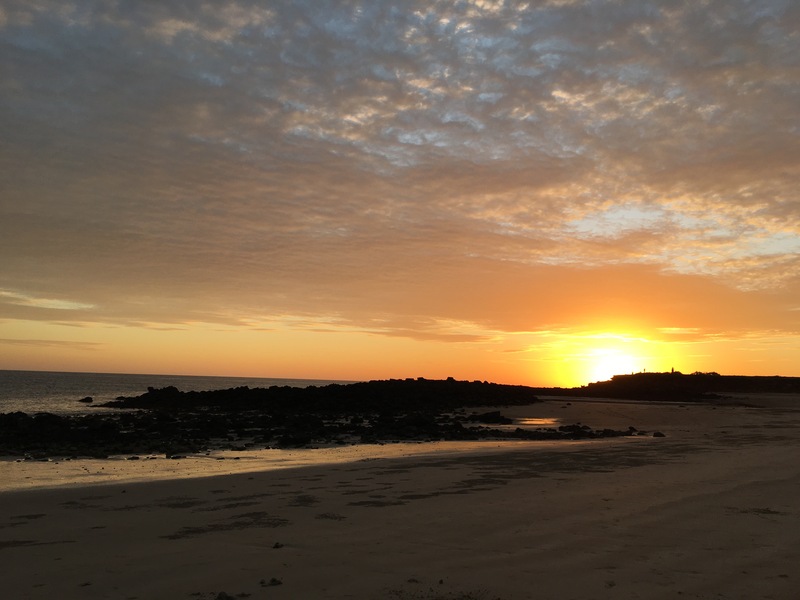 From Broome we headed up the Cape Leveque (or ‘Leveek’ as most of us bogans seem to pronounce it) road with the air let down on the tyres again. This unmade road was more sand than the others we’d driven on and graded in such a way that the two sides of the road were on a steep angle that met at a point in the middle of the road – there were a few times that I pondered what the tipping point would be where you’d move too far left and just roll over. 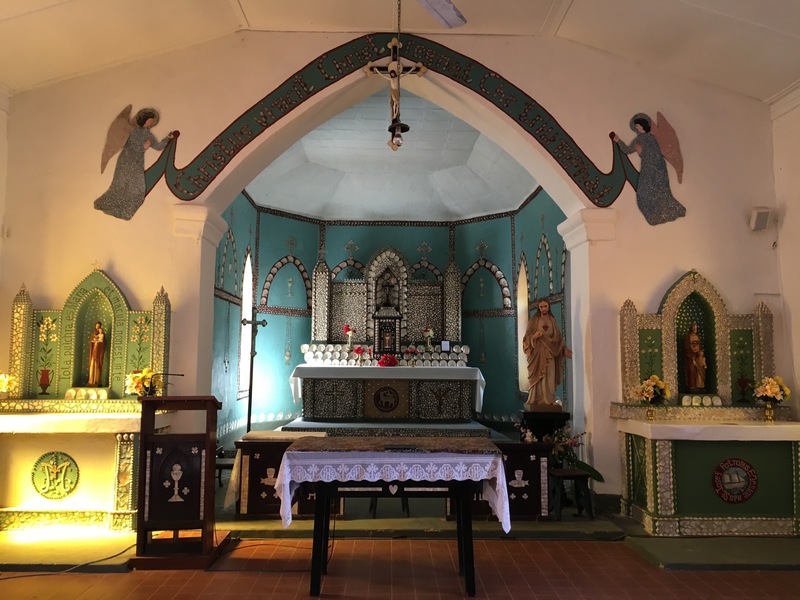 On the way to Middle Lagoon we made a stop at the famous Beagle Bay church with an alter made with pearl shells – it was a beautiful site and a lot prettier than other churches I’d been to. Luckily we made the stop as I also noticed that one of our jerry cans was only just holding on at the back of the van and had to re-tie the wratchet straps to secure that back up. Miss6 and I were desperate for a loo and Master14 was hungry (when isn’t he??) so we stopped at the bakery for some food and loo break before it was back to the sandy angled road. The turn off to Middle Lagoon brought a flatter road but much sandier one with a few hairy spots – it was a good reminder that we’re never really fully in control of a vehicle – if the sand wants you to go in a particular rut then that’s where you’re going! We set up our camp right near the ridge but with the luxury of some shady trees and a large, fairly secluded spot. 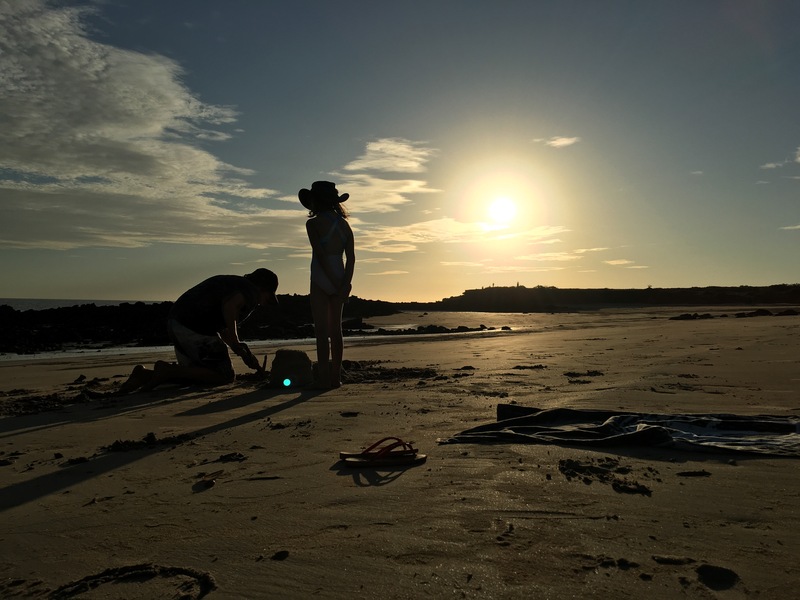 The kids spent the afternoon making sandcastles on the beach before we lit the fire and ate dinner around it and went to bed with the sounds of the waves crashing on the shore to put us to sleep. After brekki the next day, we walked down to the lagoon beach and boat ramp to have a look – it was supposed to be more kid friendly and we thought we’d spend part of the day there. Miss6 isn’t a fan of seaweed or mousse (anything green growing in the water e.g. moss – she calls it mousse) and it was dotted all along the shore so we didn’t stay long. Back to the beach along the ridge where the kids got to work splashing in the water and building sandcastles (though Master14 tends more to dig massive holes in the sand and structures that are designed to break when water is added). I made a make-shift tent with a tarp and some poles and lay under it reading my novel – a luxury I managed for most of the day. The kids didn’t want to leave the beach so I made lunch at the van and brought it back to the beach for us all to eat where we stayed until dinner time. Though we didn’t want to leave our idyllic little beachside hideaway we were looking forward to seeing Cygnet Bay. When we went to leave though, the battery was flat and I needed to jump start the car. As I was about to hook the car up to our Arkpak our neighbour offered to come and jump start us so I obliged his generousity and once we were started we could head off. I’m not sure why the battery was flat but thought that perhaps one of the kids had left a light on in the car the night before. 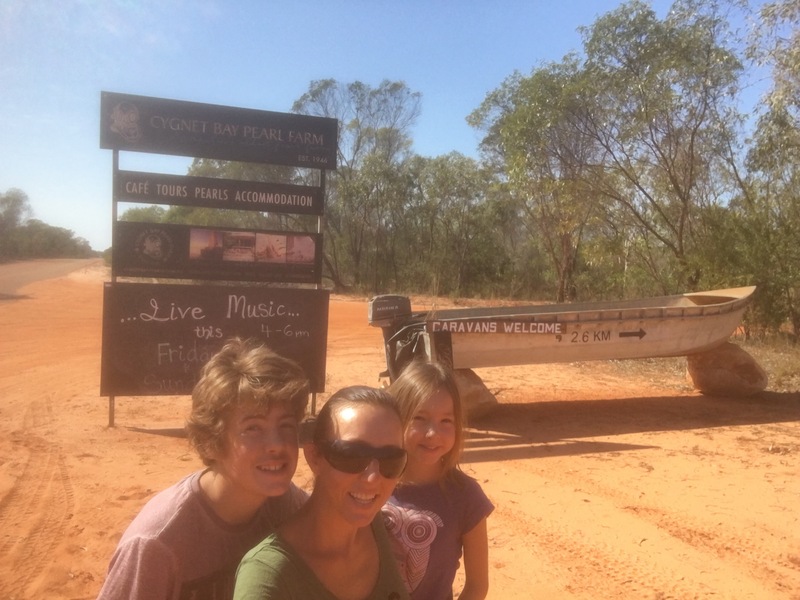 We got to Cygnet Bay Pearl Farm around lunchtime and checked in to our campsite and booked a farm tour for 3pm. When we got to our site we noticed there was a fire pit onsite and that it would be on the wrong side of the van if we drove straight in so I drove through the site and tried to reverse the camper to turn it around to have the fire pit on the door side of the van. The section at the back of our campsite was very fine and soft sand and quite deep so we soon got bogged in it. I got out of the car and started to let air out of the tyres to get us out and another camper came over to see we were ok. He offered some friendly advice (like to put it into first gear not third to try and start moving… got it thanks!) but also offered to let me drive straight ahead which would go through part of their campsite but meant I didn’t have to try and reverse the camper in the sand which, I don’t think it was doing my clutch any good as it smelt like it was burning. 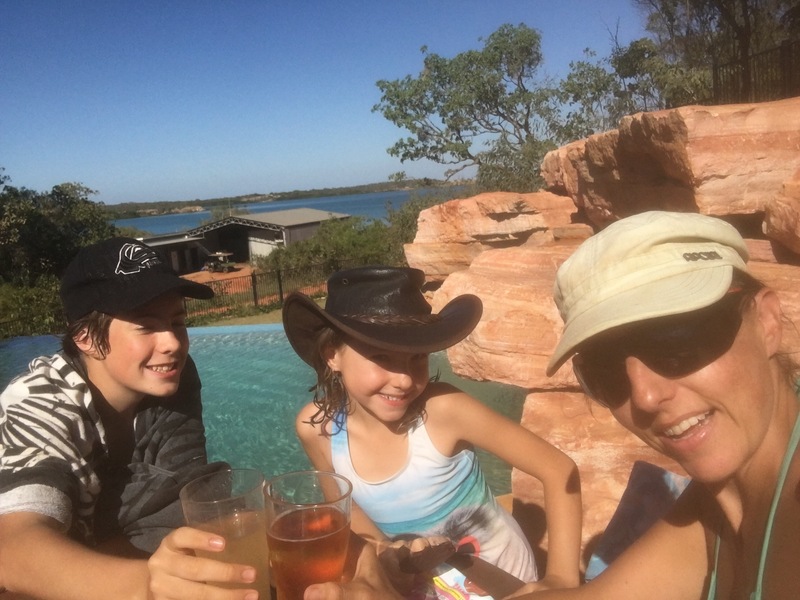 After all the excitement we decided to unhitch the van anyway and head back to reception for a dip in the infinity pool before our farm tour. 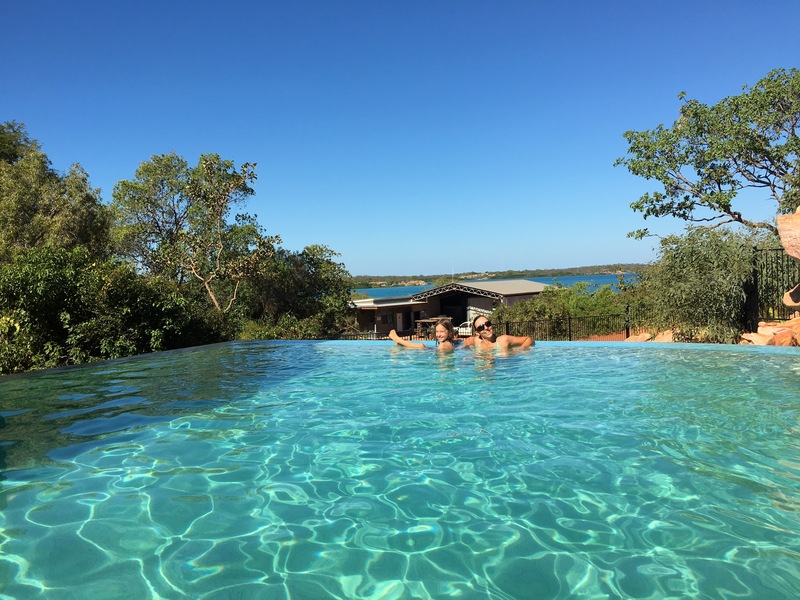 The infinity pool was cool (not as cold as Lake Argyle) and had some lovely views out to the bay. I could also enjoy a cold beer while I watched the kids swim. The tour was interesting (though not really worth the price they charge) and included a section where Miss6 got to choose a live oyster shell from a tank for our guide to open up. 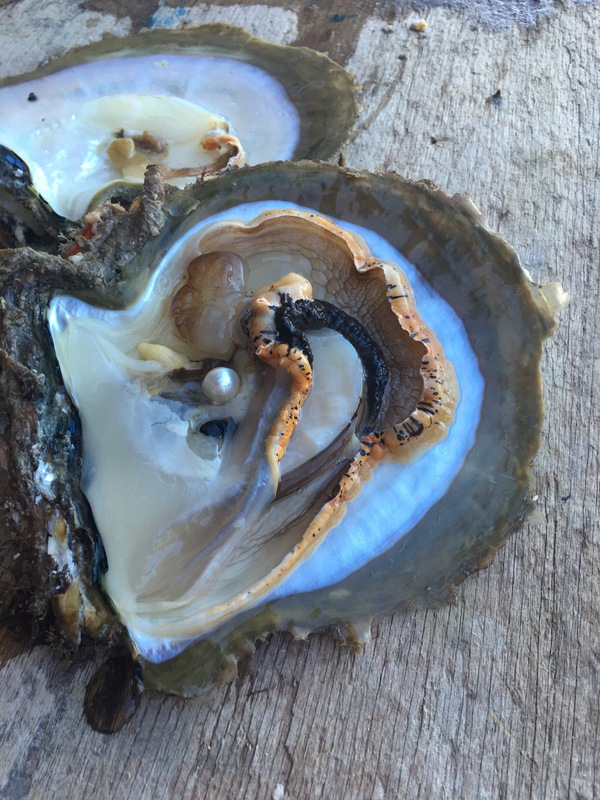 As it was an old oyster shell and at the end of its lifecycle, he broke the shell wide open to reveal the oyster with the pearl sitting right in the middle – noone wanted to touch the oyster or the pearl but Miss6 jumped straight in and pulled the pearl out! At the end of the tour we looked at a selection of different pearls, some valued up to $15,000 for a string of them, while the pearl Miss6 had retrieved got valued. It came back with a value of $24 which is less than the $25 seed they used to implant the oyster so they planned to crush the pearl for paint and re-use the seed. 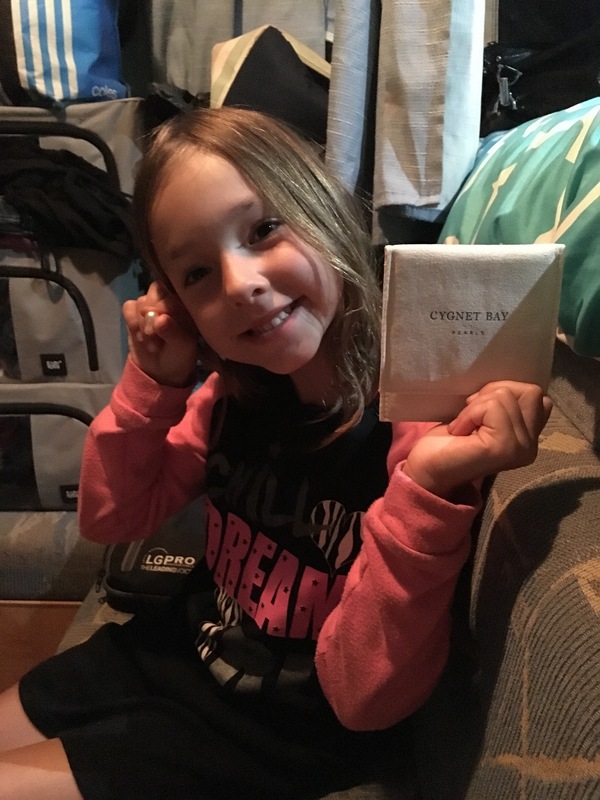 I ended up buying the pearl for Miss6 – it was probably the only pearl I could afford and had some sentimental value to it now (though if it had been a $2,400 pearl I would’ve just asked for her to have her photo taken with it!). We decided to eat at the restaurant next to the infinity pool (who can resist an all-you-can-eat buffet when you have a 14 year old with hollow legs paying the kids meal rate??). On the way back to camp we were driving up a very steep and sandy section when I noticed a huge huntsman spider run across the inside of my windscreen! The second I got to the top of that hill I stopped the car and turned every conceivable light on to find the little bugger and get it out of there. Finally back at camp and while Master14 and I hitched the car to the camper to save us some time in the morning, Miss6 started carrying on about noises outside in the ‘garden’ – we thought she was imagining things – turns out there were a heap of hermit crabs scurrying around on the dried leaves. Not sure if they were scrummaging for food but they were a fair distance from the beach and sand and though they were noisy making their way across the leaves, they were nowhere to be seen by morning. So glad you posted this blog at work before you left. 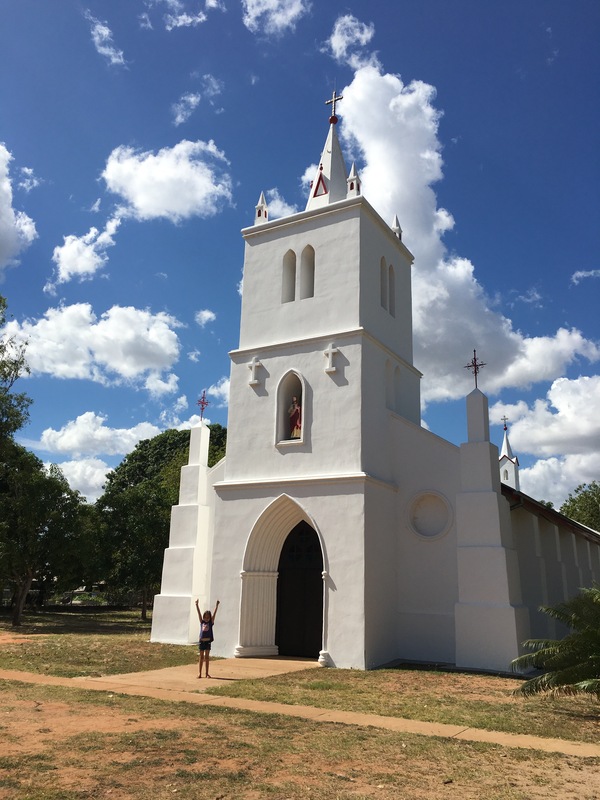 Your trip is so very similar to the trip I’ve started planning for my family in 2018. Loving your posts, it all looks so amazing! Keep having fun!